We Should Cocoa kicks off year seven with these 13 charming chocolate recipes. A new year means a new style and in case you missed it, we are no longer doing themed challenges. Anything that incorporates chocolate in one of its many forms can be included – as long as it’s vegetarian friendly of course. This month’s We Should Cocoa seems to be heavily influenced by the much loved Great British Bake Off. How sad I am that the production company has sold out and the BBC that has nurtured and developed the programme for so many years has been cold shouldered. But I digress; here, in the order in which they arrived, I give you 13 charming chocolate recipes. You’ll find the October linky at the bottom of the page. Please join in. All photos are pinned to the We Should Cocoa Pinterest Board, so do hop on over to see some of the previous recipes. Guidelines on how to enter are on the We Should Cocoa page. It was nice to join in again and oggle such lovely creations. Goodness, what a feast! Love the variety of recipes. Absolutely gorgeous. Aren’t they just and your apple cake definitely sounds like something I need to try. Gosh so many chocolate recipes in one place – my teeth are aching to bite into all of them! Yes Heidi, I know what you mean, I’m always a bit regretful when I do these round-ups that I can’t try everything. 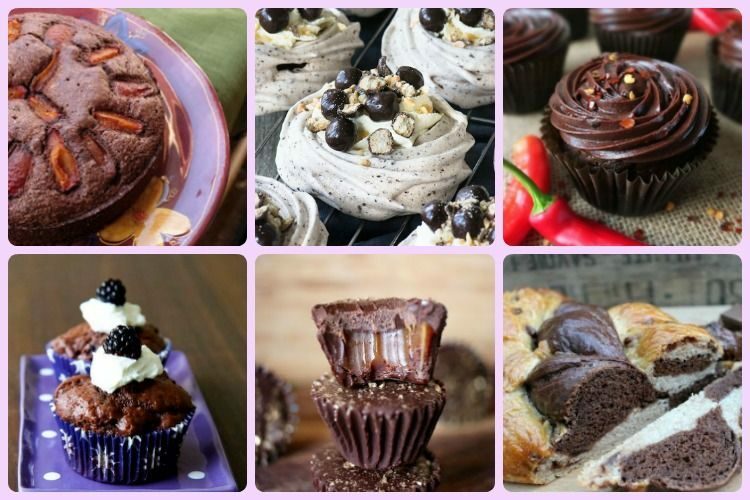 so many delicious chocolate recipes here – spoilt for choice! Once again I forgot to link up and once again I am drooling at the recipes that did get linked up! I must do it next month I must!! You absolutely must Rebecca. I’m not very good at reminders and need to send out more. Thanks Nayna. Do join in if you can. Anything that includes chocolate counts. Oh, how I wish our freezer was better stocked. It’s full of very worthy stuff, but it would be so good to be able to pull out a relatively healthy treat when I need one, rather than dashing down to the shops and buying a very unhealthy one. Mmm what a marvellous roundup of some wonderful chocolatey recipes! I would definitely like to try out a lot of these recipes. If only I could have a virtual slice! Thanks for including my challah. Me too Lucy. A virtual slice would be good, but I think I’d prefer an actual slice. Your challah is fantastic. Thanks for joining in. We can never have enough chocolate decadence in our lives! How would I even begin to know which one to try first? They all sound so good! Oh my goodness – so much chocolate., so little time! I absolutely must try out Suelle’s blondies! Hehe, exactly Nico. Blondies should come with a warning though, they are seriously good. Ooh the peanut butter blondies look awesome. Another fab round up Choclette! Doing the #WeShouldCocoa round-up is always fun, if a little hunger inducing! Gorgeous collection of chocolate recipes. I’m off to have a look at the recipes and read their blogs. There are some lovely recipes Sammie – there always are 🙂 Thanks for joining in this month.